Pelvic radiographs are helpful in assessing limb-length discrepancy (LLD) before and after THA but are subject to variation. Different methods are used to determine LLDs. As a pelvic reference, both ischial tuberosities and the teardrops are used, and as a femoral reference, the lesser trochanter and center of the femoral head are used. We validated the different methods for preoperative radiographic measurement of LLDs and evaluated their reliability. LLDs were measured on full-leg radiographs for 52 patients (29 men, 23 women) with osteoarthritis (OA) of the hip and compared with different methods for measuring LLDs on AP radiographs of the pelvis. The true LLD varied from −8.0 to 9.1 mm. When the biischial line was used as a pelvic reference, the LLD measured on AP pelvis radiographs was different from the true LLD. No difference was found when the interteardrop line was used as a pelvic reference. 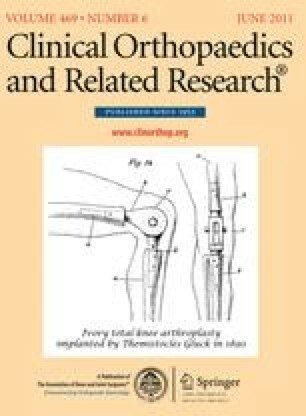 There was substantial interobserver agreement when the lesser trochanter was used as a femoral reference (kappa = 0.66–0.70) and excellent interobserver and intraobserver agreement for all other measurements (kappa = 0.84–0.93). Our data show use of the biischial line as a pelvic reference should be discouraged and the interteardrop line is a better alternative. The center of the femoral head is a more reliable femoral landmark compared with the lesser trochanter. Level I, diagnostic study. See Guidelines for Authors for a complete description of levels of evidence.